As a deal hound, one of the things I like most are deals that are stackable. By that I mean you can apply multiple methods of savings to get things you want rather than having to choose one discount over another. If you're interested in an amazingly affordable highly rated red wine shipped directly to your doorstep, along with a Wine Spectator subscription (or extension) this set of deals might be for you. If you're into collecting airline points and miles this deal gets even sweeter. Steward Ship is like Amazon Prime. For a flat rate you get free shipping for the whole year. What I like about it is that when I see a wine pop up that I'd like to try I can get it shipped out immediately without having to build towards a mixed case to reduce per-bottle shipping charges. It's also great for gifting. With Steward Ship you can get free shipping orders sent to any address. So you could theoretically send a single bottle of wine to 30 colleagues, friends and family this holiday season with your Steward Ship membership. Get FREE shipping on ANY order for 30 days with Stewardship trial. Sign up now! If you're not sure which wines you want to buy but want to take advantage of a short-term shopping portal promotion you can sometimes get bonus points for buying gift cards through the portal. Although gift cards are said to be excluded you can try double dipping the portal by buying a gift card and then using that gift card to buy merchandise. Note: I've saw a half off voucher for a Wine Spectator print subscription that's intended to be used for gifting purposes that can also be used to renew your own subscription. Check for that if you're an existing subscriber. A nice thing about having Steward Ship is that you can enter a promo code on top of your free shipping that's automatically included. Luckily that 95-point Muga is a wine from RIOJA and Wine.com is running 10% off 6 bottle or more through 11/17/2013. With Steward Ship you can ship out even a single bottle of Wine.com's cheapest wine for free. But you can also use less expensive wines to reach price points like $25 or $50 to trigger portal/subscription bonuses. By stacking some or all of these deals together you can get some terrific wines shipping directly to your home or office without having to battle holiday traffic. I ordered a bottle of Muga on Friday morning and it showed up on Saturday. 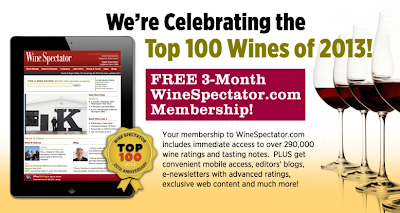 And it's nice to access to Wine Spectator print and online subscriptions - especially when you can catch them on a deal. The Wine.com and Amazon links in this post are affiliate links. Just FYI and thanks if you choose to use them.